Charity saved him from ill-feted Titanic voyage . . . In 1912, ‘Abdu’l-Bahá spent from April to December touring North America. 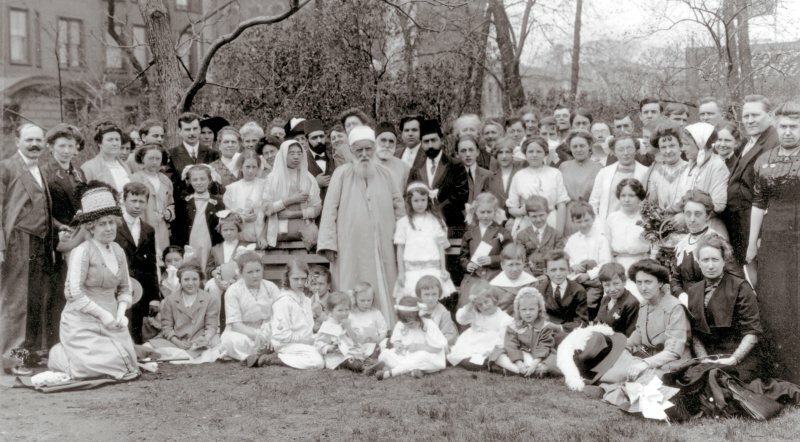 He is shown here (at center) with Bahá’ís at Lincoln Park, Chicago, Illinois, USA, in 1912. Reprinted with permission of the Bahá’í International Community. There has been some epic storytelling over the past few weeks marking the one hundred years ago since the “unsinkable” Titanic sank into the North Atlantic, taking with her more than 1,500 lives. Of all the stories, one of the most extraordinary is that of a 68-year-old Persian who was supposed to be on the ill-fated vessel but wasn’t – it turns out – actually there. Abbas Effendi – known as ‘Abdu’l-Bahá or “the Servant of God” – was feted by the press in both Europe and the U.S. as a philosopher, a peace apostle, even the return of Christ. His American admirers had sent him thousands of dollars for a ticket on the Titanic, and begged him to ride in the greatest of opulence. His saving grace for that ill-feted journey was that he declined and gave the money to charity. ← Is April 21 important to you?